Major mountain blocks of the Eastern Arc spread over fifteen districts in five regions of Tanzania namely, Tanga (East and West Usambara and Nguu Mountains), Kilimanjaro (South and North Pare Mountains), Morogoro (Udzungwa, Ukaguru, Nguru, Rubeho, Malundwe, Mahenge and Uluguru Mountains), Iringa (Udzungwa Mountains) and Dodoma (Rubeho Mountains). Governed by a Board of Trustees, the Fund was officially registered in Tanzania in June 2001 under the Trustees’ Incorporation Act (Cap. 318 R.E 2002) and it operates as a not-forprofit Conservation Finance Trust. Its day-to-day operations are run by the Endowment Fund Secretaria (EFS). The Fund’s Executive Director is the Head of the Secretariat with the main administrative offices located in Morogoro Municipality. 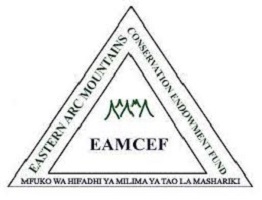 The Endowment Fund Secretariat is committed to taking exceptional care of the environment of the Eastern Arc Mountains and all stakeholders impacting positively/negatively on its biological resources. This will be possible only if the now vacant positions will be filled by right candidates.  Proven ability in writing and speaking both English and Kiswahili.  The EAMCEF Head Office in Morogoro Municipality will be the duty station for each of the positions.  Ability to work under pressure and for extended hours including working on week – ends and holidays as it may be required from time to time.  Young, energetic, hardworking, versatile and self-motivated.  Obedient, honest, trustful, fast learner, smart and socially active.  Demonstrated ability to work independently or under minimum supervision, effectively supervise and lead others. A contract of two years will be issued to the successful applicant upon satisfactory performance during the probationary period of the first three months. Depending on the ability to perform the assigned duties, the contract may be renewed at the end of the second year. An attractive remuneration package will be offered to the selected candidate commensurate with professional qualifications and working experience. Reporting and answerable to the Executive Director, the successful Planning and Communication Assistant (PCA) will be a principal player in all activities and functions related to planning, information and communication management, marketing and outreach aspects of the EAMCEF. (POPC) and appropriately assist, back – stop and gap – fill in his/her functions as needed.  Assist in raising awareness to local communities and other stakeholders on the linkages between conservation and socio-economic development. the Endowment Fund and the benefits available through the Fund programmes.  Assist in timely planning, budgeting and progress reporting for all programme activities.  Assist in handling of publicity, education and extension activities.  Facilitate, supervise and follow up implementation of field activities financed by the Fund.  Assist in identifying, preparing, appraising and reviewing proposals for funding by the Endowment Fund.  Assist in developing and facilitating relevant training and out-reach programmes in order to build the capacity of EAMCEF and stakeholders.  Assist in information collection, processing, storage and dissemination including proper handling and management of IT equipment, software and operating systems.  Assist in developing, updating and operationalization of the Programme contents of the Strategic documents of the EAMCEF. targetting potential supporters and other EAMs stakeholders.  On an ongoing basis, review, enhance and manage an always updated, appealing and effective website of the EAMCEF.  Make effective research on existing and potential future donors (donor mapping), design and facilitate the implementation of appropriate approach mechanisms. through production and communication activities fit for social media (Website, Twitter, You-Tube, Facebook, Instagram, etc).  Assist in preparation and production of Video Documentaries for EAMCEF success stories. achievements, ongoing and pipeline projects, and how partners can engage and participate.  Assist and facilitate the process to improve the Search Engine Optimization (SEO) for EAMCEF in the most popular search engines, e.g. google, etc for Tanzania, Eastern Arc Mountains, biodiversity conservation, climate change, poverty alleviation, community development, environment, biodiversity and climate change research, etc.  Assist in the preparation and operationalization of a robust communication management strategy and policy, design criteria and powerful communications tools.  Assist in the preparation and operationalization of a computerized programme for field data collection, coding, processing, storage and dissemination/reporting.  Investigate computer user problems, identify their source, determine possible solutions, test and implement solutions.  Install, configure and maintain personal computers, workstations, file servers, network cabling and other related equipment, devices and systems.  Doing any other activity as may be instructed by the Executive Director and other Senior Staff from time to time.  Advanced Diploma or a Bachelor’s Degree or equivalent in Information and Communication Management, Marketing, Project Planning and Management or related field from recognized and reputable higher learning institutions.  Formal training and excellent skills and knowledge in Information and Communication Technology (ICT).  At least one (1) year of practical experience in marketing/outreach activities from similar institutions/programmes/projects.  Good interpersonal skills, ability to work in a team and capacity to establish and manage partnerships.  Strong background in conservation, socio-economic development, planning and engaging.  Good writing, presentation and communication skills.  Act as principal and immediate assistant to the Finance and Administration Officer and appropriately assist, back – stop and gap – fill in his/her functions as needed.  Data entry and analysis for a variety of issues and subjects.  Preparation of financial transaction documents, e.g. payment vouchers, requisitions, purchase orders, payrolls, etc.  Originating and initiating the payment process for various transactions as needed.  Undertaking the preparation and writing of cheques, posting in cash books, payment registers, ledgers, etc.  Assisting in verification of financial expenditure reports submitted by Project grants recipients/implementers.  Assisting in the preparation of reports and documentation required for internal and external auditing as appropriate.  Following up on creditors, debtors and suppliers/service providers as needed.  Making cheque and cash payments for staff, customers and partners as appropriate.  Playing the role of a cashier and doing banking and bank transactions as required.  Logging in, inventorying and updating stores and fixed assets registers.  Assisting in the management, maintenance, servicing, use and control of vehicles and their movements as required.  Summarizing vehicle log books and preparing monthly vehicle reports.  Back-stopping and assisting in stores management including store keeping, proper receiving and issuing of goods and stores.  Undertaking purchases of minor items and participating in the procurement functions as needed.  Assisting in various administrative and management issues and aspects as appropriate.  To ensure office buildings are maintained in good order and condition at all times.  Ensuring that all payment requisitions are complete with all the necessary supporting documentation such as pro-forma invoices/bids, local purchase orders, selection minutes, delivery notes, tax invoices, etc. before making payments.  Ensuring that all payments are properly coded and cancelled by PAID stamp.  Recording and posting of approved financial transactions into the accounting system.  Making and processing advance payments including travel advances, sub-contractors/grantees advances, etc.  Prepare monthly statutory returns e.g. PAYE and other statutory contributions in a timely and accurate manner and ensuring all the filing is appropriately done.  Assist in audit planning and preparation for auditing and timely resolution of audit issues.  Advanced Diploma or First Degree in Accountancy, Commerce, Finance, Accounting and Finance, or its equivalent from a recognized and reputable higher learning institution.  Knowledge and competency in Information and Communication Technology (ICT) applications, and familiarity with a variety of accounting softwares.  Knowledge and experience in accounts payables, receivables, cash, bank transactions and maintaining the general ledger.  Ability to maintain a high level of accuracy in preparing financial and accounting information.  Ability to maintain confidentiality concerning financial and employees/vendors files.  Act as principal and immediate assistant to the Programme Officer – Planning and Communication (POPC) and appropriately assist, back – stop and gap – fill in his/her functions as may be required from time to time. framework, toolkits including performance indicators, baselines, targets, milestones and benchmarks for each aspects of the EAMCEF.  Assist to develop and implement a systematic approach to integrate programme defined inputs, indicators and results (Outputs, Outcomes and Impacts).  Assist in the coordination of project evaluations and in capturing best practices emerging from the intervention strategies.  Assist in building a modern digital information management system allowing real-time portfolio analysis and releasing human resources to technical monitoring.  Assist in the monitoring and evaluation and associate their contributions into the achievement of the overall results.  Assist in making sure that exercises and findings from the monitoring and evaluation positively inform the development of new intervention strategies. emerging from the programme activities.  Assist to put in place systems and mechanisms for collecting data to monitor the development of defined indicators under the comprehensive reporting framework.  Assist to develop and implement a standardized Management Information System accessible to the Senior Management Team Members and other relevant parties.  Assist, provide back-up support and appropriately gap-fill in the functions of Field Project Officers as it may be required from time to time.  Assist in setting up a Monitoring and Evaluation system and follow up closely its operationalization.  Build capacity of field staff and partners to set a functional groundwork for efficient data collection, entry, compilation, processing and timely reporting at site level, district level and programme level.  Contribute to development and implementation of the organization’s M&E framework including indicator mapping.  Facilitate utilization of reports at site level and district level for programme planning, management and evaluation.  Lead the preparation of M&E based quarterly feedback reports from the grantees and field partners.  Maintain proper records on implementation of the programme which will provide basis for decision making and feedback to stakeholders.  Carry out any other responsibilities as assigned by the Executive Director, immediate supervisor and other Senior Staff.  Formal training in Results Based Management (RBM) and/or Monitoring and Evaluation (M&E) will be one of the necessary conditions for selection.  Computer literacy especially competence in MS Excel and Statistical packages and database management. sponsors, government entities and other key stakeholders.  Proven knowledge, skills and experience in Results Based Management (RBM). Interested candidates should lodge their applications to the undersigned not later than 05th November, 2018. Separate application letters with detailed CVs, copies of relevant academic and birth certificates, one recent passport size photograph and contact details of three referees for each of the posts should be made. Only shortlisted applicants will be called for one or more interviews within one month from the application deadline.